From the outside, the Bat and Ball Hotel looks like your average neighbourhood watering hole. But once inside, it reveals itself as an English-themed pub; there are London Underground maps and other British paraphernalia on the walls, and the menu boasts of Pom influence- pickled eggs, bacon chip butties, and a sauce collection prominently featuring Heinz brand tomato sauce and sweet chilli, Colman’s mustard and the obligatory HP sauce. It’s all wood-polished timber, including the floors which is a welcome change from most garish, smelly hotel carpets, and the furniture is a mish-mosh of leather couches and brightly coloured bar seats with comfortable backs. It’s a tad on the dark side inside (hence the lack of great photos), but that lends itself to a charming, cozy, homey feel – it’s a great winter – and now with spring upon us an evening – pub. The first time Phil and I happened upon this establishment, it was a bank holiday Monday. As we walked in, we were greeted with signs on the door stating that Monday night was “all-you-can-eat-WINGS” night – $9.90 for bottomless wings! Surely, I thought, such an establishment would not offer an amazing deal on a public holiday? But I was pleasantly surprised to walk into a roomful of people enjoying pitchers of beer and happily munching of plentiful bowls of wings! The sweet, friendly barmaids confirmed that the deal remained in place, a true sign of a great establishment which knows that treating its customers well (e.g., not ripping them off on a public holiday) goes a long way to win loyalty. Hence, this blog. Near the food service area known as the “Parkside Diner” are several extremely inviting, comfy-looking booths (my FAVORITE thing in a pub.) We’ve happily slid many a time into the polished leather, settling ourselves in for great conversation and a great meal. The place feels like it’s made for drinking pitchers of beers and munching on wings whilst pleasantly chatting to your mates – well played, other patrons. Now, it’s our turn. Bottomless Bowl of Wings* (*Mondays only- $9.90; other days, $9 for a serve of 8-10) which come with a side of creamy “ranch” sauce. These wings – and most wings that are served in Sydney pubs- are coated (e.g., heavily tossed in flour or a thin batter) then fried. Normally, I’m not a fan of this style of wing preparation. I prefer non-coated wings, offering up crunchy, crispy chicken skin, as the hot oil sears the skins and seals in the juicy meat. However, these coated wings still managed to be quite crispy. The coating was peppery with a hint of celery salt and tossed in a “mild” wing sauce, although they still had a hint of spiciness. The ranch sauce, clearly an American influence, was very good, but the “ranch”-ness flavour (of which I am an expert, being a Yank) was not very detectable, possibly because of the strong flavour of the wings. If you’re lucky enough to be there on a Monday and you’d like more than one serve of wings, just inform the lovely barmaids who double as waitresses will happily oblige you. They’ll even provide you with extra napkins and a hand bowl for cleaning. Crispy wings with a side of ranch! Finger cleaning bowl brought round by the world’s nicest barmaid. 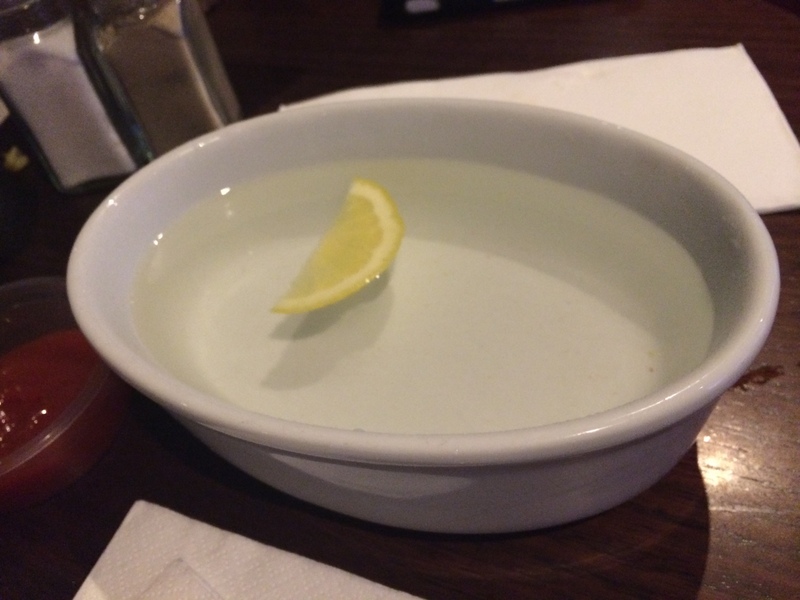 It was hot water and they even floated a lemon in it! Bless. Pulled Pork Burger ($16),was served on a brioche bun (a personal fave; I like the sweetness brioche lends to a burger) with cranberry bbq sauce, coleslaw, cheese & chilli mayo. I LOVE pulled pork and the sandwich was quite tasty, but also very messy and required a knife and fork to tackle the mound of meat, bread, sauces, and slaw. The hot chips were steak fries (another personal fave) and were yummy. I like my hot chips golden brown and crispy as, and the Bat and Ball delivered. Pulled Pork Nachos ($16) were decent, but not the best thing I’ve eaten here: I’m used to big, sloppy, messy nachos with stupid amounts of cheese. I was also hoping for some BBQ flavour in the pulled pork. In addition, I thought the amount of toppings on the nachos were a bit on the light side, especially considering the price. However, Phil thinks I’m being a greedy guts – he reckons the pulled pork nachos are great. Ingredients are corn chips, cheese, pulled pork, black beans, baja sauce, guacamole, pickled jalapenos, and pico de gallo. Hot Dogs ($5) were specially on offer for 4th July (the American independence holiday). We indulged in a chilli cheese dog and a bacon sauerkraut dog, both of which were very authentic and tasty, and washed them down with steak fries. 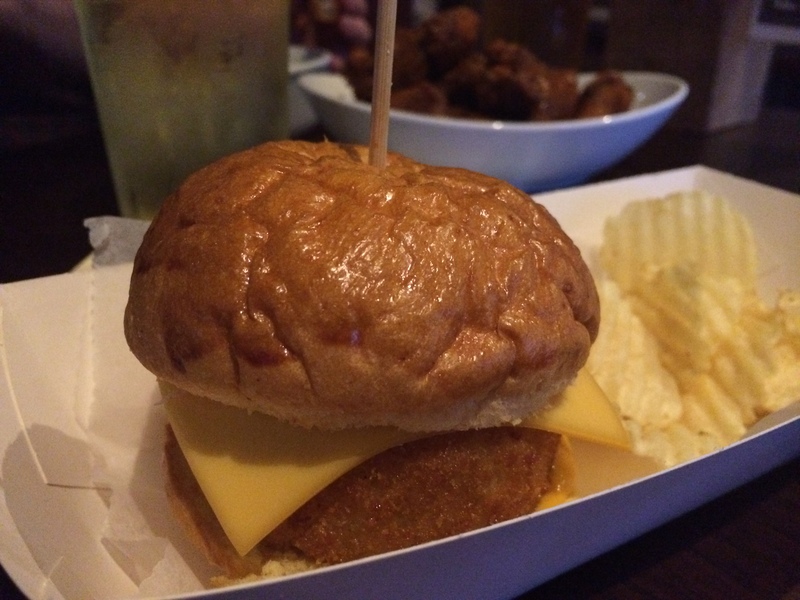 Mac and Cheese Slider ($7) is unique to the Bat and Ball. 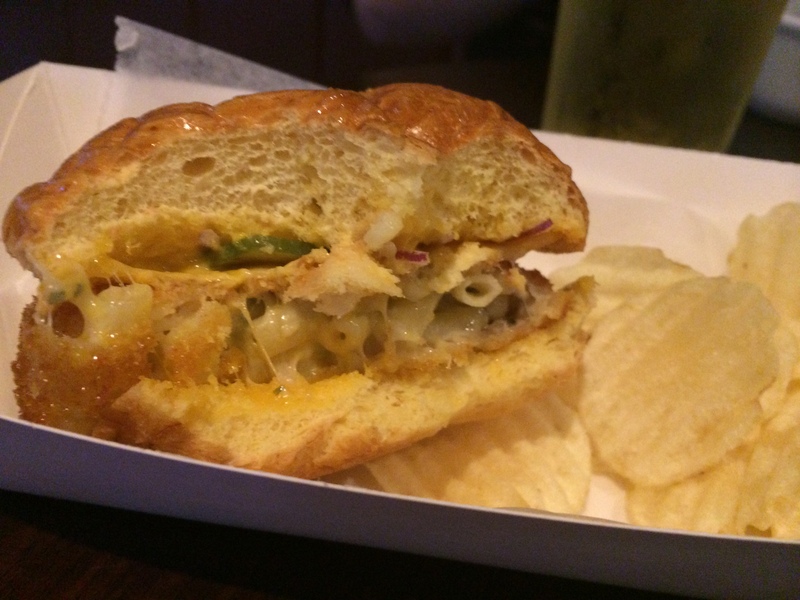 I’ve never seen a mac and cheese slider anywhere else. The menu states the slider contains “gruyere, cheddar, parmesan, american cheese, burger sauce, pickles, and onion on a brioche bun, served with crisps” . The mac and cheese arrived as a crumbed, deep-fried patty, topped with yet another slice of cheese (American. The best burger cheese, period.) 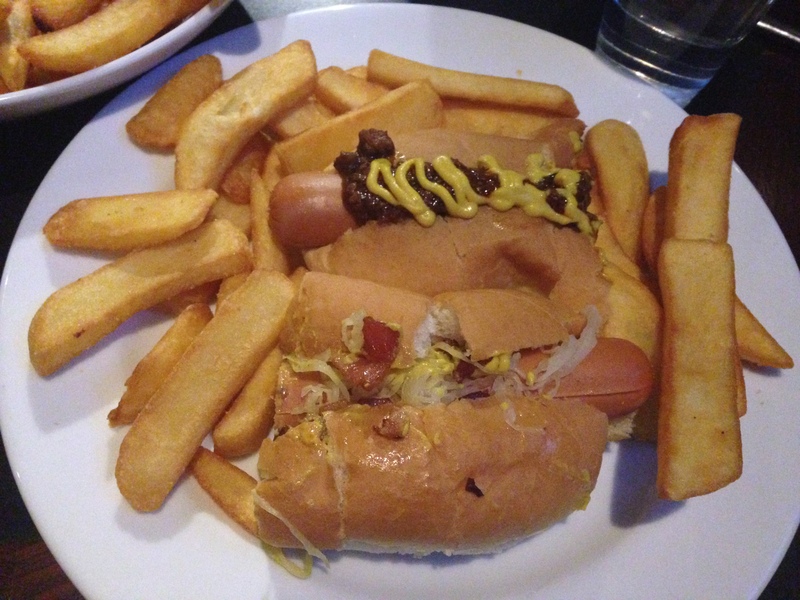 It was also considerably bigger than other sliders I’ve had, so I felt it was great value for money. The taste? It was worth every artery-clogging, bum-widening bite. Mac and cheese slider. The inside reveals itself to be just that. Mind: blown. Now for the drinks: the beer selection contains the usual suspects: Hahn Super Dry, Coopers Original, Lashes, etc. A schooner will set you back $6; a pint $8 – reasonable prices considering many a time I’ve (grudgingly) spent $8+ on just a schooner. The draught cider (my normal tipple) offers both pear and apple from The Hills Cider Company– an excellent, refreshing beverage, and a welcome change from the normal Bulmers. Not sure about the wines, but on Fridays from 5-7 all beers and wines are $5. We’ve often sauntered into the Bat and Ball for happy hour (and wings!) on a Friday, to find the place with only a handful of patrons, nodding to each other about our rare find: a Sydney pub doing great food with reasonably priced grog, served by friendly staff. In Surry Hills, no less. Meanwhile, a block away, Bar Cleveland heaves with hipsters unaware of the pub-y goodness just down the road, ready and willing to feed your face with deep-fried mac and cheese and bottomless wings. It’s our opinion that the Bat and Ball is one of the best-kept secrets in Surry Hills, and in Sydney for that matter. And now you’re in on the secret too. *This blog is by Liz Kaelin, the You Chews Founding Foodie. We’ve received no compensation/free food from the Bat and Ball Hotel. All opinions entirely our own. 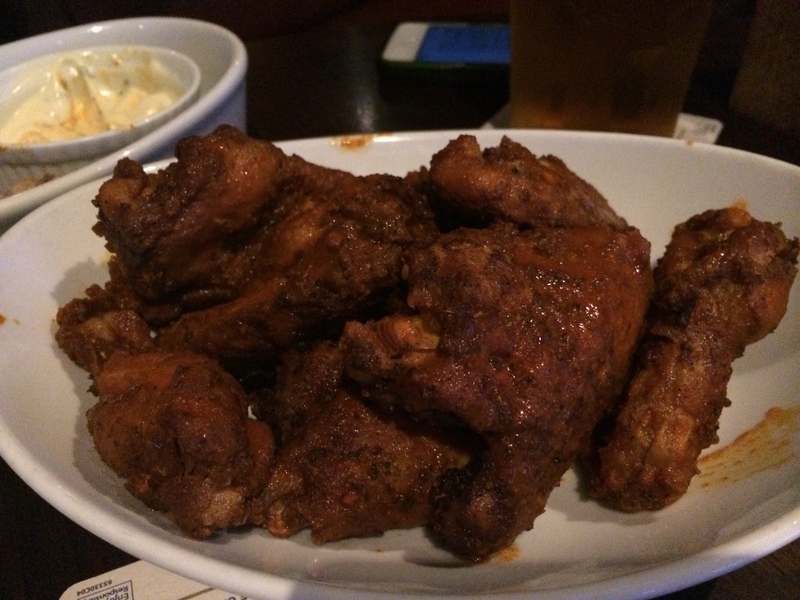 Pingback: $9.90 All You Can Eat Hot Wings w/ Ranch Sauce - Mondays @ The Bat & Ball Hotel, Redfern NSW - Getluckyonline- best offers, deals, sales, coupons. Save money! Fantastic pub great service from friendly smiling staff wanting to making your experience at the pub a very memorable one.